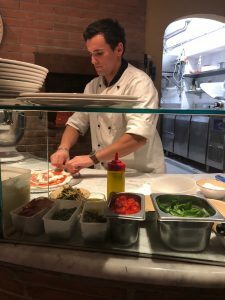 One of the unique things that SAI offers in Florence is the chance to learn how to cook like a true Italian, through free cooking classes. The first class I took was on Valentine’s Day and allowed me to spend the day with my first love, pizza. A group of ten or so SAI students met in a local restaurant in Piazza San Marco where we were greeted by the pizza chef, who doubled as our comedian for the evening. He discussed the history of the margherita pizza and then proceeded to show us how to make pizza dough. We learned that there are two ways to make pizza dough, one if you need to use the dough in three to four hours and the “better dough”, that can be used the next day and requires quite a bit less yeast. We did not have time to prepare and wait for our own dough to be ready for cooking, so the chef had 24-hour dough pre-made for us. We then tested our abilities in stretching the dough, which was somewhat difficult, and even managed a few air flips (only two inches above my hands but hey, it was still airborne!). When the dough was finally stretched to the right size and thickness, we got to top our pizza to our liking. 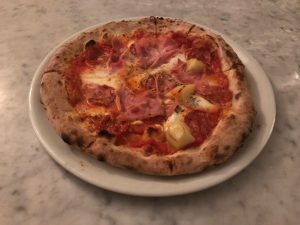 I settled on adding sauce, mozzarella, pepperoni, prosciutto and then decided to branch out and try a few potatoes, a topping encouraged by our chef. 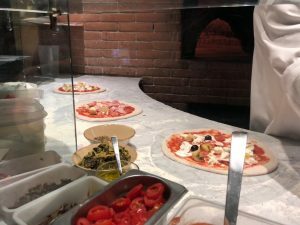 Once we had finished topping our pizza, the chef put them in the brick oven at a temperature of 800 degrees, which allowed the pizza to be perfectly cooked in only a minute and a half. It was then time to eat. Our chef joked throughout the evening that our pizza would be the best pizza we’ve ever had, and he was not wrong. My handmade pizza was my favorite pizza of all the pizza I’ve had so far in Italy. Regarding the potatoes on my pizza, I was pleasantly surprised to find it was delicious. Now I won’t be a professional pizza chef anytime soon, but it was so much fun learning how to make my own pizza, the Italian way. Maybe one day I will equip my home with a brick pizza oven but until then, I’ll just hold on to my memory of making pizza in Italy. Alli is a spring 2018 SAI Florence student from the University of South Carolina.